Welcome to Table Talk Math. This week, we're overhauling the idea of Valentine's Day Grams. Great news! For the Spanish version of this week's newsletter, click here. Ed Campos has joined the team to provide a Spanish-translated version of our newsletters for parents who would appreciate it. Check it out and send Ed some love! Also, feel free to share the link (bit.ly/TTM26spanish) with your Spanish-speaking friends. This week, my wife came home with a box of cards for our son to fill out and distribute to his first grade classmates. They're super cheesy and lack sincerity, but I guess that's what we've come down to. As the kids get older, the distribution of cards becomes less and less until, at some point, they disappear altogether. Well, thanks to Desmos, the free online graphing calculator that you really need to know about, you can now give out Math-O-Grams! Sure, you can use one of the pre-created templates and email it to a friend, but you can also create your own. To create your own, head over to desmos.com/calculator and start designing. It would certainly help if your child is in high school, but it isn't necessary; here's one you can play with. 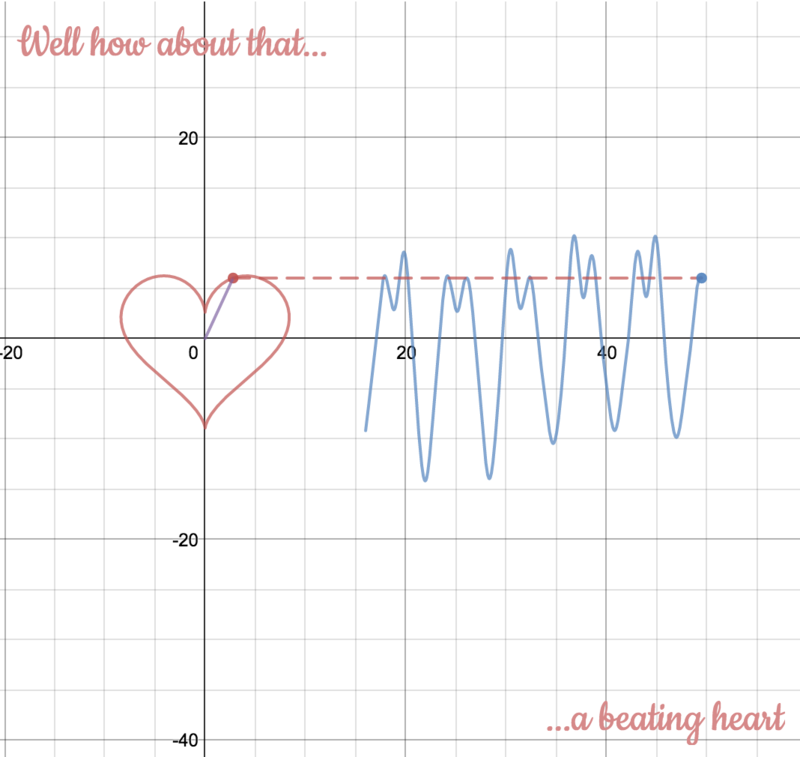 What can you create with mathematical functions that express your affection for a friend or loved one? I'd love to see what you come up with! Share your work by emailing them back to me, posting them onto Twitter, or sharing them on the Table Talk Math Facebook page. A number of people mentioned that a Spanish version of the newsletter would benefit them or parents that they knew, so Ed has joined the team for that support. If you have any requests, please feel free to let me know.